Australian Kangaroo 1 oz gold coin or Gold Nugget as it is also called was introduced in 1989 in different denominations starting with 1/20 oz. and ending with the 1 oz. gold Kangaroo, being minted by the Perth Mint. These lower denominations have been kept until today and are still issued. However, starting with 1991 there were also bigger varieties of this Australian gold coin like the 2 oz, 10 oz, and 1 kg of pure gold. The Australian Kangaroo 1 oz gold coin is also known under the name of Gold Nugget because between 1986 and 1989 the reverse of these coins depicted Australian gold nuggets so famous around the world that the name is still used today even though a kangaroo has taken their place. An Australian Kangaroo 1 oz gold coin is characterized as having the following properties: as the name of the article suggests it weighs exactly 1oz or one troy ounce which is the equivalent of 31.10 grams. This weight is completely represented by the weight of pure gold, these Australian coins having 99.99% fineness or 24 carats. A coin also has a 32.10 mm diameter and a 2.65 mm thickness. Together with the Chinese Gold Panda, the Australian Kangaroo 1oz gold coin has a different design every year. More precisely the reverse that depicts these respective animals is the one that changes. So this is one attribute that makes these coins so special. Since the design changes every year, we are going to talk about the one illustrated on our website. The obverse of an Australian Kangaroo 1 oz gold coin is constant every year, no matter the denomination. It is an engraver realized by Ian Rank-Broadley in 1999 depicting the portrait of Her Majesty, meaning the portrait of Queen Elizabeth II. The legend reads AUSTRALIA, ELIZABETH II, and the face value of 100 DOLLARS at the bottom of the head side of the coin. 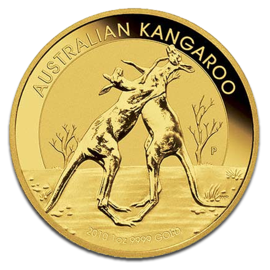 The reverse of the Australian Kangaroo 1 oz gold coin illustrates 2 kangaroos in their natural habitat while playing with each other. The inscription at the top of the tails side of the coin is AUSTRALIAN KANGAROO and at the bottom is inscribed the issuing year, 2010 in our case, and 1 oz 9999 GOLD. The Australian Kangaroo 1 oz gold coin is a bullion coin and also a legal tender in the issuing country. It is a really popular coin among investors due to its great bullion characteristics and due to the fact that it can become liquid. Gold investment has raised much interest across the globe which made the price of gold increase. Therefore, it is a proper time to invest into bullion gold like the Australian Kangaroo 1oz gold coin which has the greatest purity. If you cannot afford for the moment the Australian Kangaroo 1oz gold coin you could orientate yourself towards smaller denominations. As longs as it is an investment into this precious metal it is just fine. If an individual found in the position of an investor wants an Australian Kangaroo 1oz gold coin minted in 2012 he will find it on our website together with other years in which the coin was issued.